Aah, The First Day of Fall. It feels a lot like Fall. By Jove, it is Fall ! Kanumesse is the big European paddlesports Industry showcase event. Not open to the public, it is a product platform for new (?) ideas and designs that will be available for next season. It's a chance for the suits to hype up their knaf gimmicks and hang out with some hot birds in need of some instruction. 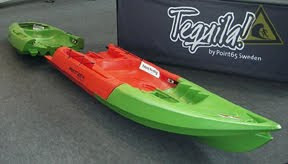 P&H showed off there new double skegged kayak.? Two 'inline ' skegs, one controller.. We will have to ask Ben Lawry about this one.. Some very hot looking PFD's from Palm... the accessory that they just can't quite get right... after all these years ! Why is it so hard to design a suitable, comfortable, practical vest ? And of course, this...the sectional SOT...well, about time. So there you have it. Lots of great new stuff coming our way 2010. Did we mention Stand Up Paddle Boards ? Last year, volunteers in 100 countries working with Ocean Conservancy's International Coastal Cleanup removed seven million pounds of trash and debris in a single day. Most of it was from beaches, riverbanks and lake shores. As much as 70% of all trash that that goes into the ocean sinks to the bottom. Of all this trash the most prevalent and damaging is fishing gear. The hand cast nest, hooks and monofilament that we find on a regular basis, either washed ashore or entangling wildlife are Lilliputian compared to the commercial fishing nets and traps abandoned or lost at sea. Some commercial gill nets are several hundred feet high and up to 6 miles long. Pacific trawl nets can easily swallow up a Boeing 747. 'Ghost Fishing' as it is know, is becoming an increasing concern for all our oceans. In crabbing and lobstering regions, the presence of abandoned pots is a deepening concern. In the Gulf of Mexico 250,00 pots get lost a year and derelict traps claim between 4-10 million blue crabs each year in Louisiana. An estimated 20-30 % of all New England lobster pots are lost each year. Stats and info from The Ocean Conservancy. As a big thank you to all our customers for making it a great summer season, we would like to offer a week of half price classes. L1-4 for Sea Kayak, Surf Kayak, SOT, and Canoe. Call to reserve a spot. First come first serve. Please join Ogeechee Audubon at 7:00 PM on Tuesday, September 15 for a program about Georgia's Important Bird Areas (IBAs). The IBA program is an international effort to identify and protect areas and habitats that are critical breeding and/or feeding sites for birds. National Audubon and its local chapters are central to this effort in the United States. Georgia currently has identified 44 IBAs; 12 of them are right here on the Georgia Coast. On Tuesday, our speaker will be Charlie Muise, IBA Coordinator for the entire state. He will give us some important insights on how ordinary citizens who care about bird conservation can help the IBA program to achieve its goals. The program is free and open to the public, so feel free to bring a friend or neighbor. We will meet at our new, temporary location in the First Presbyterian Church at 520 E. Washington St. in Savannah. With warm waters and great waves, Tybee in the fall is one of the best places in the U.S. to increase one's paddling skill level. 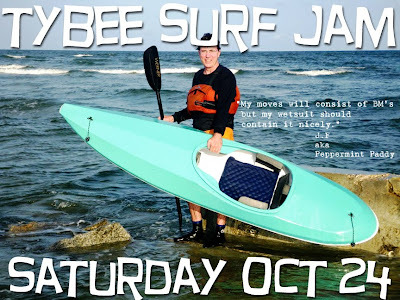 With the coming of the Tybee Kayak Symposium, there will be many 'highly qualified instructors ' teaching a wide array of techniques and styles. "Generally" - I'm the only person who believes this. "Basically" - This is going to get complicated. "I think that " - Nobody else agrees with me. "In my honest opinion" - I don't believe a word of this. "Simply put" - Everything before was a load of waffle. "The point I'm trying to make" - No one is listening to me. "In the not too distant future " - It's never going to happen. "Wow, fantastic " - Finally! FAC - Fancy a Cuppa? And some commom English to American translations..
Fanny, front bottom = Well, you know..
Fall Season Up & Running. All classes, except rolling, are half price from Monday Sept 21 to Friday Sept 25th. This includes all surf kayaking and sea kayaking levels. So, come on...lets get prepped and ready for some great winter paddles. Summer Season Ends with a Bang & a Fire. A very busy Labour Day weekend marked the end of a fantastic summer season here at SC&K. 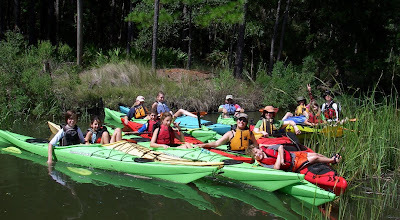 "Its been 100 days of 'balls to wall' paddling on the Ga waterways. We have had a fun summer." said a representative not authorized to speak. 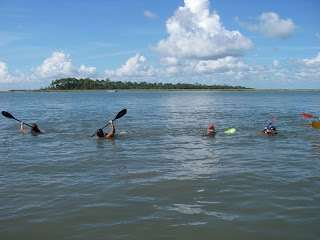 "Sunday was a boating frenzy of all shapes and sizes and the usual stuff was left behind on Little Tybee. Grills, tables, chairs, bear cans and other 'Use it and Leave it' camping paraphernalia now sits on Bucks Beach." Not content with just leaving behind their crap, one Little Tybee visitor manged to burn down two acres of maritime forest on Myrtle Hammock. Tybee officials requested help from Chatham County who directed the Mosquito Control helicopter to douse the fire. For about an hour the helicopter scooped up 120 gallons at a time and brought the fire under control. The '09 Fall season will begin in ernest tomorrow. 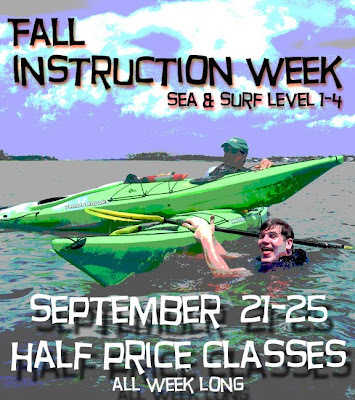 Dont forget that September 21st to the 25th is Instruction Week with half price classes. This Posting has been Retracted. Due to a negative after taste the posting 'Give us a Break' has been deleted. Those responsible have been sternly reprimanded and discharged of their responsibilities. SC&K supports all and any paddling and outdoor activities that exercise, educate and enhance the human spirit, regardless marketing strategies and over commercialisation by capatalist exploitationists. Normal operating procedures will resume shortly. Event details are formulating nicely. Contestants are signing up. We are strongly recommending that newcomers and locals take part in this 'fun of a kind' surf jam. Entry is $50 and covers ACA event membership, a hat, and raffle ticket. Pre-registration is mandatory. No walk ups. Sign in and boat check is at 7am Saturday @ 18th St Beach access. Sunday October 25th will be the rain date. All competitors must sign a waiver, wear a life jacket and helmet, and have suitable floatation in their boat. All boats must be named. First Timers. 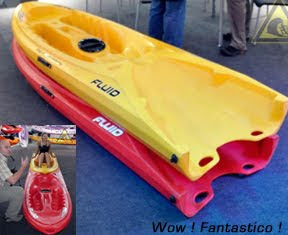 Any surfable, seaworthy kayak under 11ft in length. Any age, any gender. 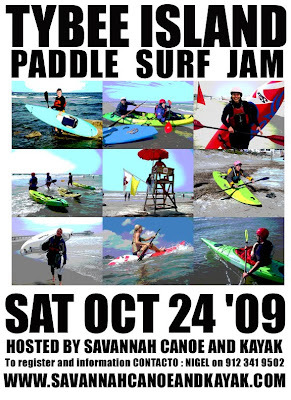 Must not have competed in a surf kayak contest before April '09. High Performance - Men. Any Surf Kayak or Ski under 9ft in length which meets WSKA guidelines. Any age. Points will be awarded and count towards US Team trials for the 2011 World Championships to be held in The Outerbanks. High Performance - Women. As above, but for the ladies. International Class - Men. Any Surf Kayak or Ski of 3 meters meeting the WSKA rules and guidelines. Any age. International Class - Women. As above, but for the ladies. Young Guns. Under 21's. Any kayak under 11ft. Inbetweenies. Between 21 and 55. Any sea worthy kayak under 11ft. Old Bastards. Over 55 and any kayak under 11ft. Tandem. Teams of two. Kayaks supplied. 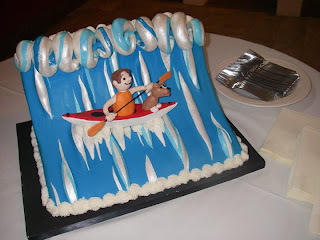 Sea Kayak. Any sea worthy sea kayak over 15ft. Any age. Registration is $50. Each participant may take part in up to 4 divisions. If you sign up for only one division, you will surf at least twice. Heats will be 15 or 20 minutes long (to be decided). Surfers will be judged for style and flair, best use of the wave, wave selection, take off and end moves. Prizes and trophies will be awarded at the beach at 3pm. We hope to get Joeys Surf Movie "Interference" to show in the evening at Huckapoo's. 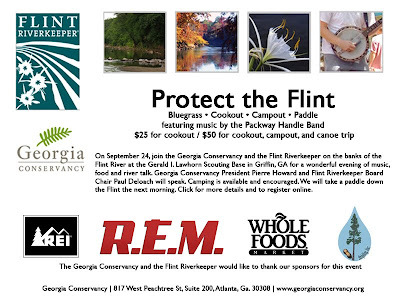 This is an ESKA sanctioned event. A big thanks to Joey Hall.